As I type this, Hynda is barking furiously at my feet and Szuka is breathing heavily at my elbow. 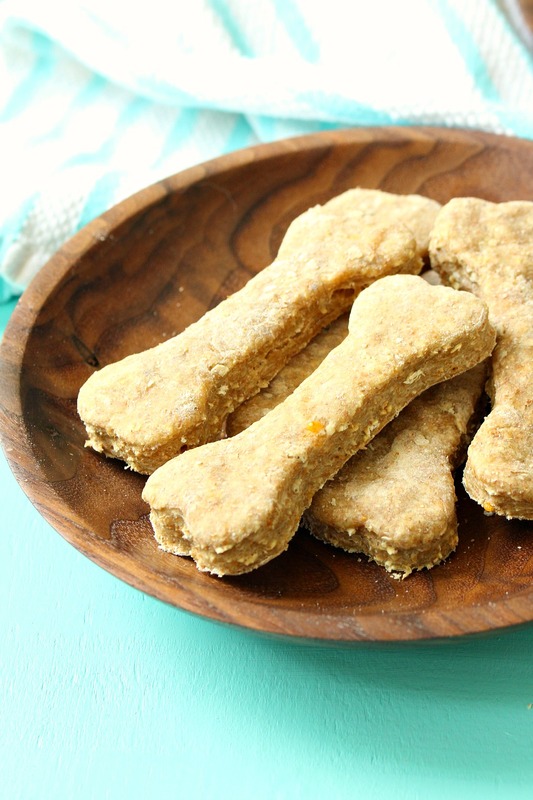 I’ve been eating the homemade dog treats I baked for them all day, and they can smell the cheese and oats on my breath. In my defense, all foods I prepare must go through quality control. 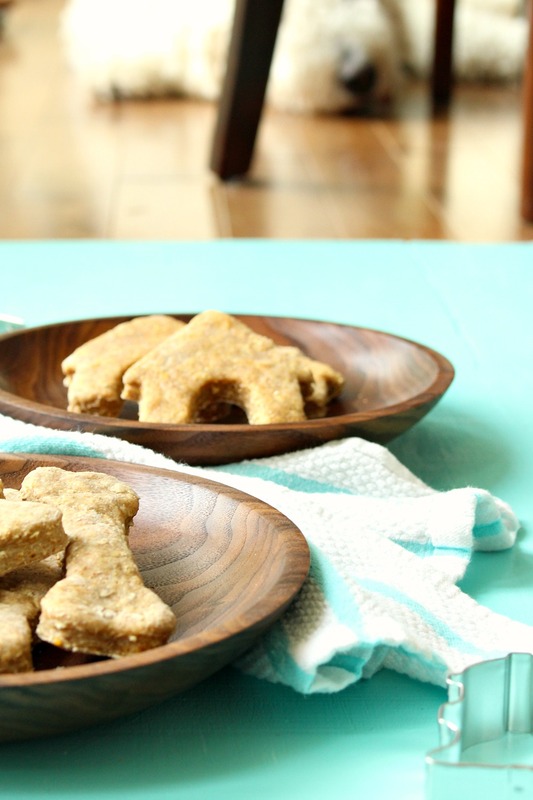 I’m a huge fan of making homemade dog treats because not only do I get to ensure quality ingredients, I also get to use up stuff from the fridge! A couple of years ago I confessed that I liked making Szuka “kitchen sink” cookies, using up delicious leftovers like pureed pumpkin, bacon grease and shredded carrots. Anytime I had some yummy leftovers from our meals, I set it aside for Szuka and made a random batch of cookies, adding wet and dry ingredients until it was knead-able. I am a HUGE fan of made up meals and baked goods for humans too. I struggle to follow a recipe without adding some of my own flair. One night Hubby and I had the munchies and we were so desperate for cookies. I caved and started whipping up some but I had such an odd assortment of dry goods so I just kept mixing and adding and, in the end, made some kind of delicious carrot cake meets oatmeal cookie muffin top-type thing, sweetened with maple syrup. They were INSANELY delicious (we all know the muffin top is the best part of a muffin). Anyway, weeks later Hubby asked for “muffin top cookies” and I had NO idea how I had made them!! So I’ve been trying to write down these made up recipes in case something turns out so tasty I want to recreate it. 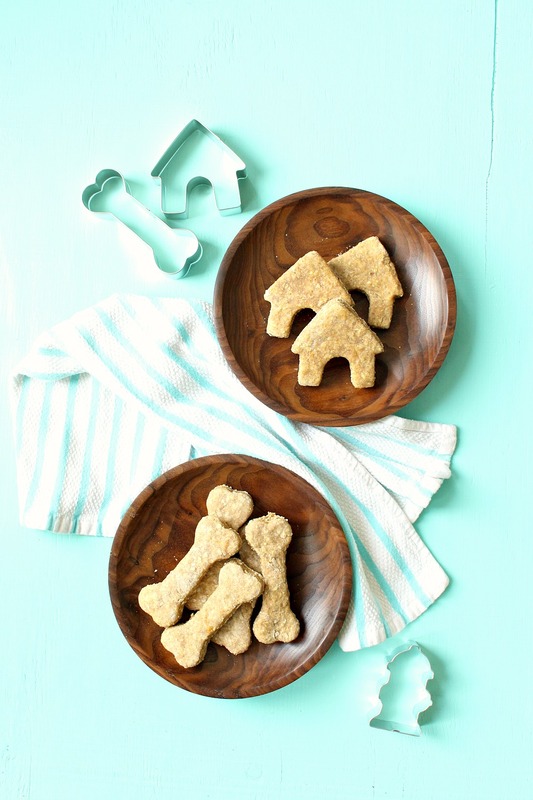 I’m sure Szuka will appreciate this too, because there have definitely been some homemade dog treat versions she’s loved more than others, but no two batches are alike. 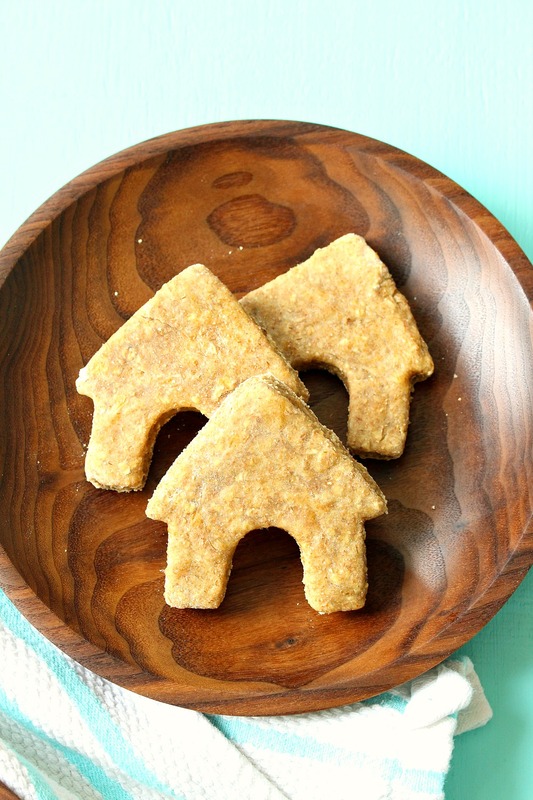 Here’s my first official homemade dog biscuit recipe: a simple cheese and oat treat – typed up and everything. It’s easy, tasty (trust me) – and the perfect base for adding other flavors and ingredients (here are some great ideas for flavor combinations). 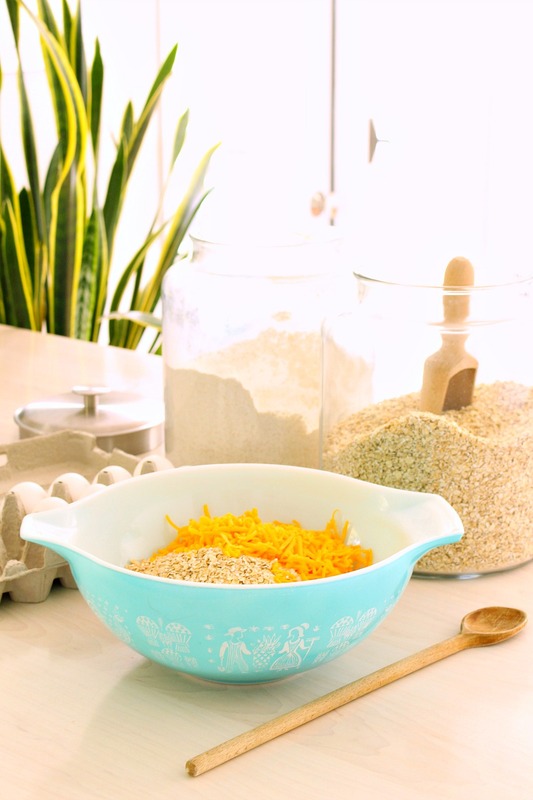 After measuring out the ingredients, I mix together the oats and flour and then just toss in the cheese, broth, and eggs, mixing with my hands until I can form the dough into a ball. (If it’s a little dry, you add a bit more water or broth and if it’s too wet, add a scoop more of flour or oats). Knead on a floured board and then roll out. 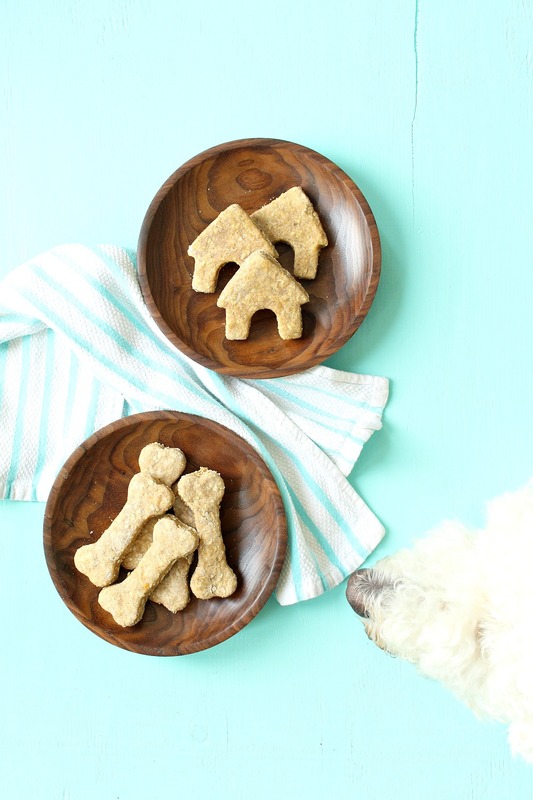 These are very durable cookies and I have baked itty bitties with giant ones together – they’re not delicate like a human cookie and they won’t burn easily at all, so don’t stress about the thickness, just adjust to your pup’s preference. 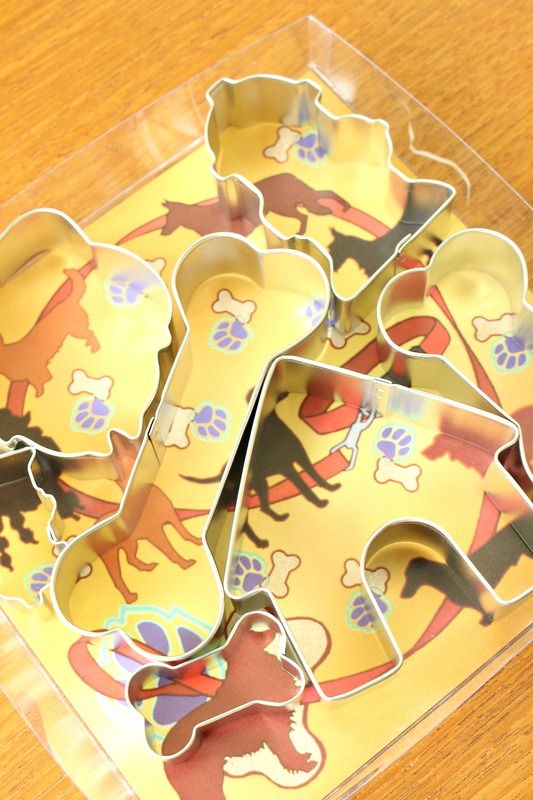 Dog themed cookie cutters are a must so everyone know who these are for! (Although that did little deter me from eaten half a dozen of these). This sweet set is from Wayfair (they have such a great pet section). Bake these at 350 degrees for 15-20 minutes for the smaller size and 20-25 minutes for the larger cookies. I liked to use parchment paper or a silicon mat. When I bake them for this long, I use them up pretty quickly. If you want to store them safely for longer, double the baking time and really let them dry out and get hard. In my defense, they eat my food all the time. It’s not fair. Can we just talk for a minute about Szuka’s self control? Hynda, on the other hand, LOST her mind for these cookies – and I almost lost a finger in the process. How are those tiny teeth so sharp?! I tried to snap an adorable photo of her chowing down on these cheesy treats but every photo was a blur. Once she’d gobbled five cookies while I tried to snap the perfect pic, I managed to get this clear shot. Does that look like a contented pup with a full belly, or what? 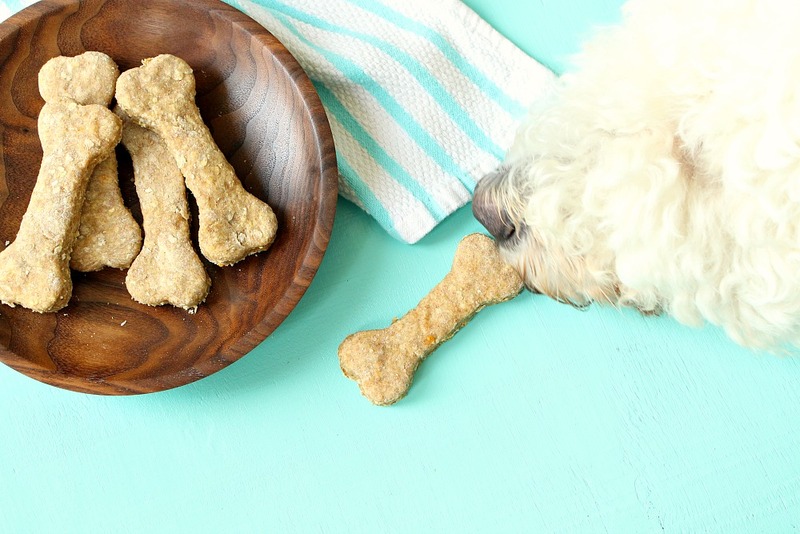 Have you baked anything yummy for your pups recently? This post was sponsored by Wayfair but all thoughts, opinions, and puppies are my own. 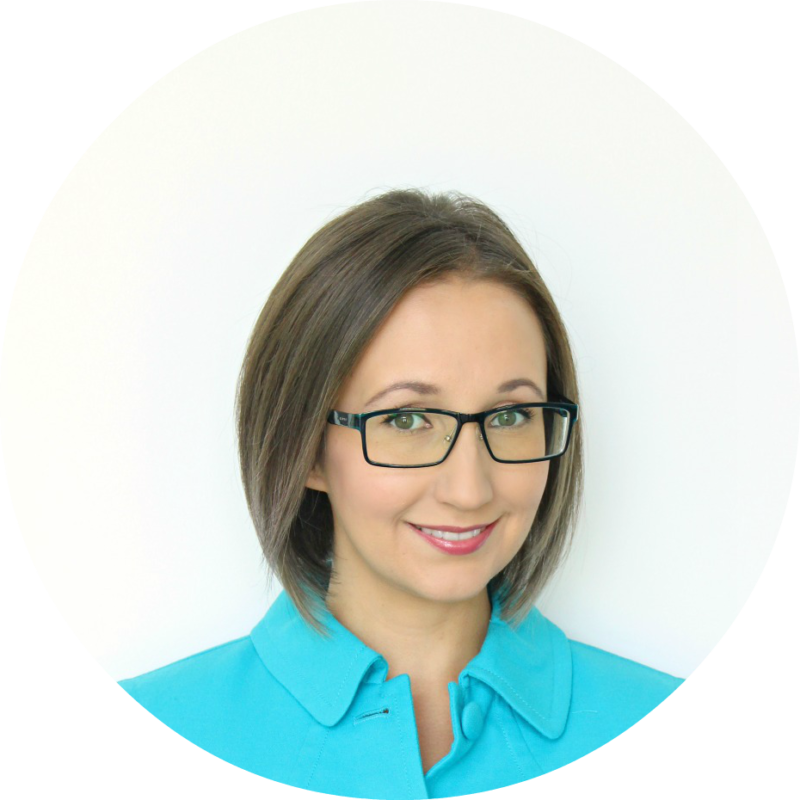 Hi Tanya!! I will have to make these for my guys! I baked some peanut butter home made treats for a bake sale fundraiser for a local lady who is a pet rescue centre.I wish I had seen this earlier! Next time! Oooo peanut butter is definitely a favorite around here so I am sure that there were some happy pups that day. 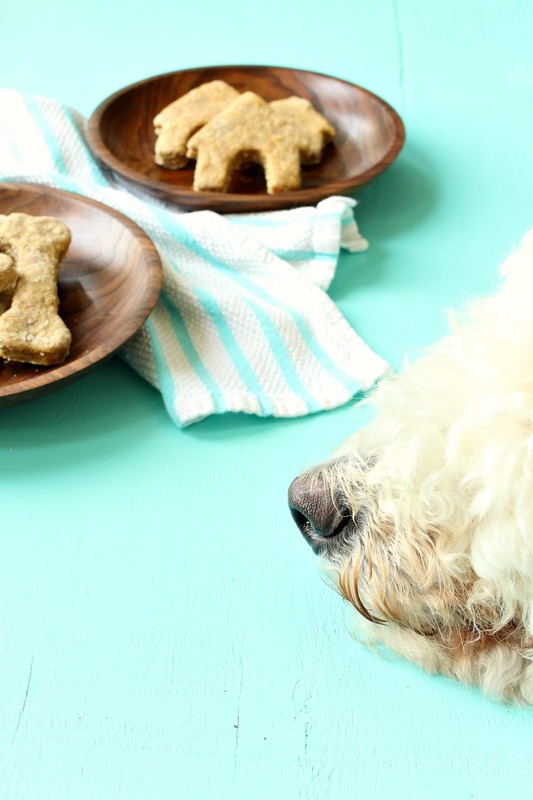 What a sweet idea: a bake sale for a pet rescue centre! I love that! And how sweet of you to bake something too. Are your pups getting along these days? Mine are still not getting along too well, but Hynda is calming down the tiniest bit so I'm hopeful. Haha, those faces are impossible to resist. And they have been following me since I baked, begging for a treat. Every time I turn around, they are behind me, sitting like good little girls. They look delicious. Are you sure they're for dogs? I just started cooking all my dog's food (I saw a documentary about processed dog food that made me ill). She eats a mash of baked chicken thighs, scrambled eggs, brown rice, sweet potatoes, peas, fish oil, and vitamin supplements. Sometimes when I'm out of food for myself I find myself eyeing hers! It's a lot of work, but I do it in a giant batch for the month and freeze it in baggies. I'll try your treat recipe. It's so much better than the stuff you buy in stores which can have questionable ingredients from China. Even the treats which are labeled "made in the USA" or "made in Canada" can import some of the ingredients. 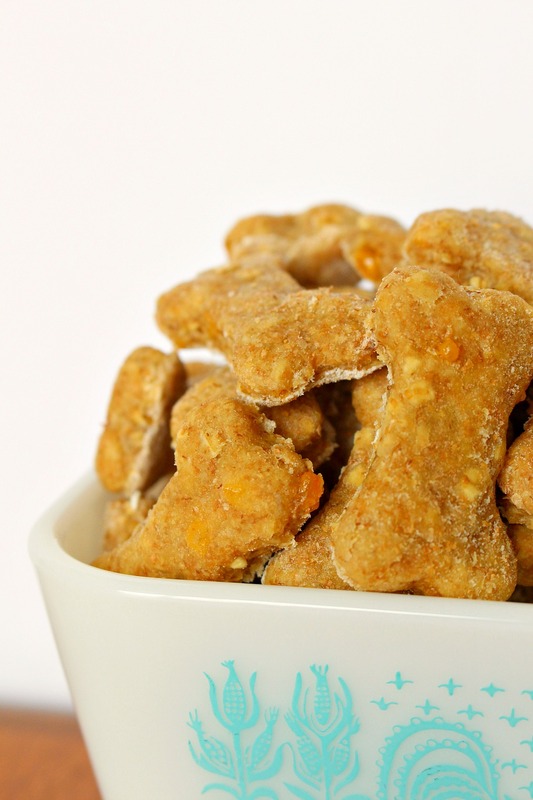 There have been many cases of dogs who died after eating treats that had been contaminated. At least in the US, there is very little regulation and no real legal recourse because pets are considered property and don't have the same legal value as a human. 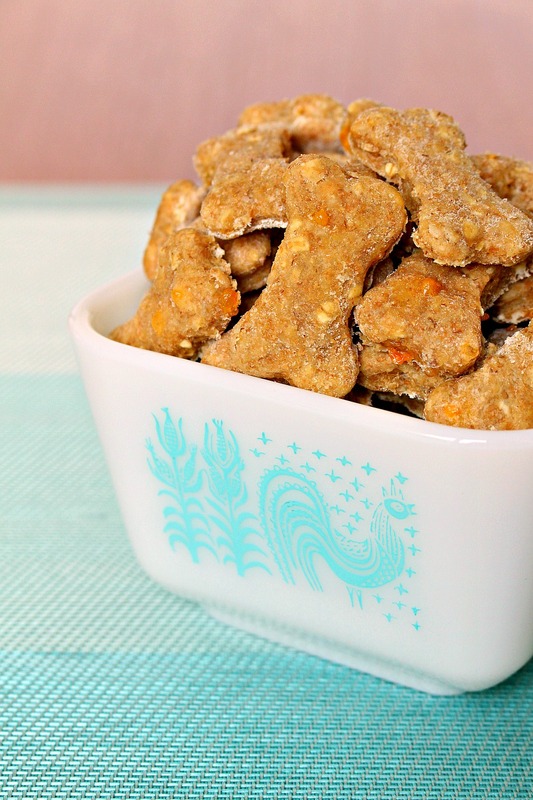 Homemade dog treats are the awesome! I tried some frozen treats recipe throughout summer and now I have this to try too!